In my life this week ... This is what I like to call one of those "ordinary" weeks. And I love them! I have no plans in the evenings. Today I was able to get my housework done. Tomorrow we will go to the library and the recycling center. And we might make a trip to the water park. Wednesday we have no plans during the day and I will enjoy a "Wine Wednesday" date with my husband in the evening and then watch my favorite summer pleasure So You Think You Can Dance. On Thursday we are going to attempt, again, to go pick blueberries. (I hope the weather cooperates!) On Friday we have Co-op gymnastics and an opportunity to swim in the afternoon. Saturday I might take the kids to the Blue Bell Ice Cream Factory Open House ... FREE ICE CREAM!! Then on Sunday we will go to church and then relax at home in the afternoon. Perfect week. In our homeschool this week… Again, an ordinary week. Other than the activities listed above, each day will just consist of the daily morning chores list, our reading assignments and lots of free play. Places we’re going and people we’re seeing… We'll see our Co-Op friends and church friends this week. My favorite thing this week was… all of the celebrations we participated in ~ Rick's birthday, our 10 year anniversary, Father's Day and a friend's 5th birthday. What’s working/not working for us… Allowing each person in our family to enjoy summer in his/her own way is working. It feels like such a relaxing atmosphere and everybody is full of joy. Questions/thoughts I have… The debate between making your kids get up at an early time and work around the home all summer according to your schedule and allowing your kids to stay up later and sleep as late as they want (as long as they are getting their responsibilities done when asked) because summer only lasts for a season and then the hard work of school starts again. Obviously I have my own opinion, but it's something I have pondered (for a nanosecond). Things I’m working on… a picture recipe for Blueberry Biscuit Yummies so that when we get back from the blueberry farm, the kids can make them "themselves". I am also still continually working on Dawson and Brynne's U.S. History binders. I'm still a week behind, but working to get caught up this week. Then I'll have 12 weeks of unit study complete! Books I’m reading… Barefoot by Elin Hilderbrand, Seasons of a Mother's Heart, by Sally Clarkson (reading with the moms in our Co-op Playgroup), More Faith in My Day by Emilie Barnes (my daily devotional), What Your Second Grader Needs to Know by The Core Knowledge Foundation. I love to see this! School takes on many forms in the summer months. 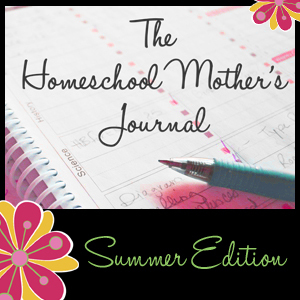 Hop on over to The Homeschool Chick to see what it looks like in other homes. I debate the sleeping in/late; staying up late situation within myself every single day! I still haven't decided what's best. How about something inbetween? They can stay up an hour or so later and sleep in a little bit in the mornings! That's what we do around here! LOL Makes it a little easier to get back into the rhythm of school in September when our sleep schedules aren't TOTALLY off! Anyway, sounds like a great week!